Flying Aces was blessed with good weather. Shock! Such stuff headlines are made of! Yes, we were given a fair crack of the whip this time, with sunshine and a low breeze [which did however increase during the day]. There is a catch though, as the breeze was rolling off the trees giving strange turbulence. [Models would be going fine, heading for what one thought for a good flight, and then suddenly it was as if they were shot down]. Frustrating or what. I saw most of the main protagonists, including:Chris Strachan, Gordon Hannah, Mike Stuart and a clutch of Grahams. I wasn't expecting Roger to make it [he'd been rushed to hospital the previous day ] but he did, which was good news and it was great to see Chris Richards also. Unfortunately Chris burned his thumb quite badly and had to trot off to A&E to have it seen to. 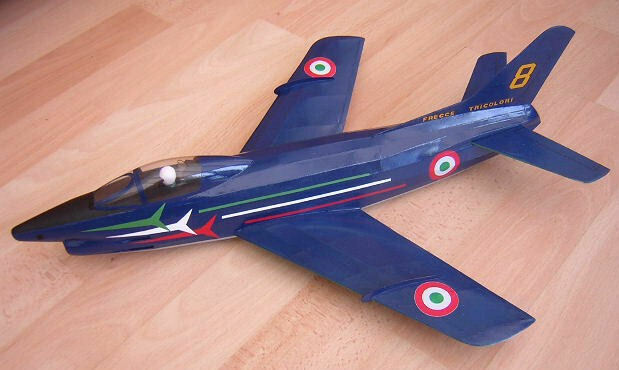 On a good note, I was fortunate enough to win Jetex/Rapier profile scale using the Dr Simmonds designed T38 Talon. 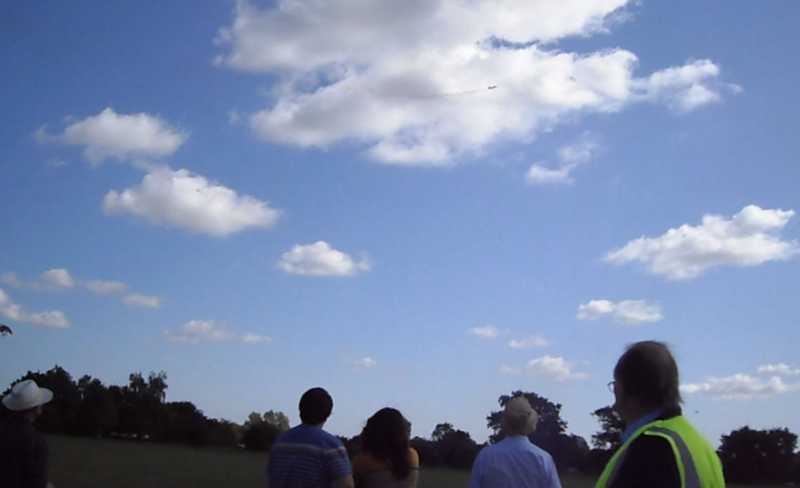 It's earlier stratospheric flights at Old Warden were continued using Rapier L2X motors. 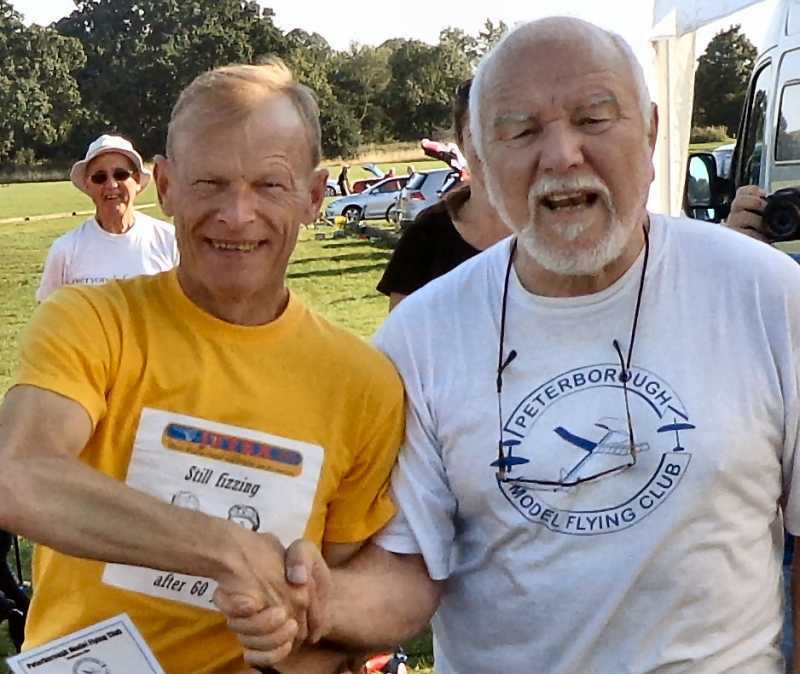 Such is the kudos of former chief test pilot Andy Sephton, I was elated that I'd finally beaten him in competition. I'm still not worthy to wash his feet though! Later we had a bashat getting Roger's Corsair and cutlass trimmed which was good fun [if a little expensive in motors due to the tricky conditions].. Mike Stuart won the jet scale and Marie Gabrielle Richards won duration. This was a day just like we needed. I was pleased to get to my favourite PFA this year, especially after being in AAU all day on Saturday. I managed to speak to Mike Stuart and Chris Richards, but we missed Richard Crossley and the Digby's. It was good to witness Andy's spectacular flights with the T-38 Talon. 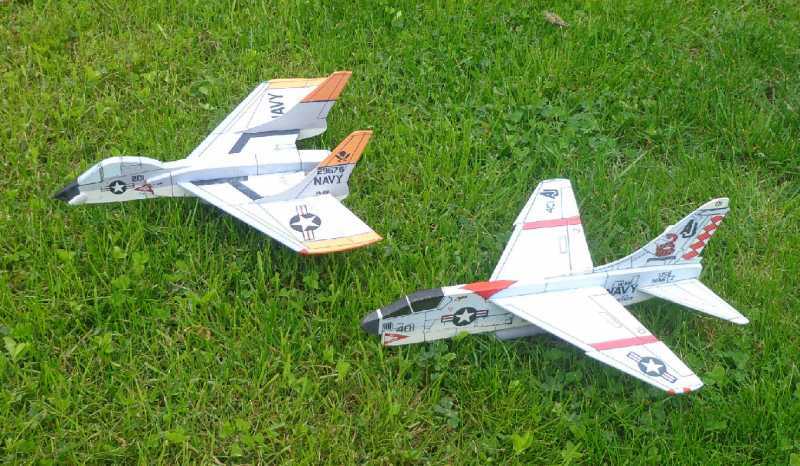 I had a couple of excellent T-38 sorties of my own. I'm starting to think it's my best model yet. So far it hasn't missed a flight - a rare thing for any Rapier model, especially in turbulence. Of which there was a lot about. Above: Andy with Bernie, PMC Chairperson. 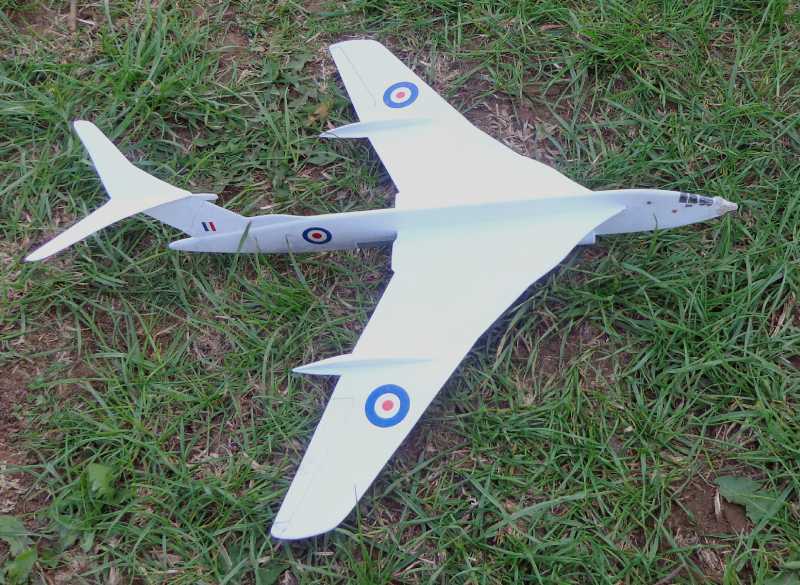 It would be good to see this fly with Howard's Valiant. Anyone for a Vulcan? 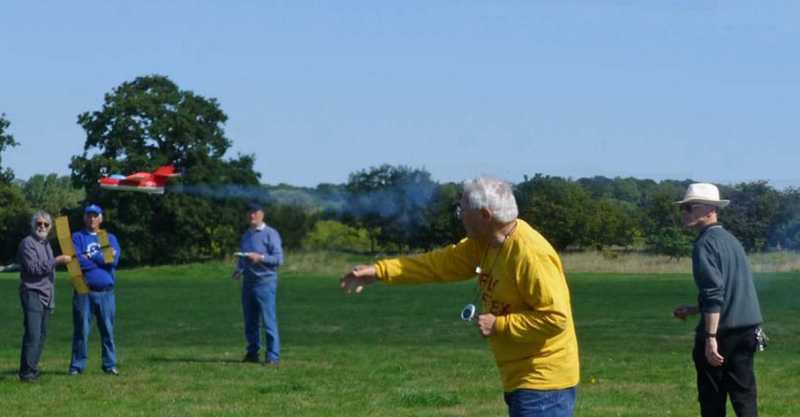 Mike's model usually flies well and steadly with a standard L-2, but on this occasion it was struggling with the conditions, being bounced about low down in the turbulence. Andy gave him an L-2X which resulted in an unpredictable loopy flight that ended up down wind. But it did score enough points! 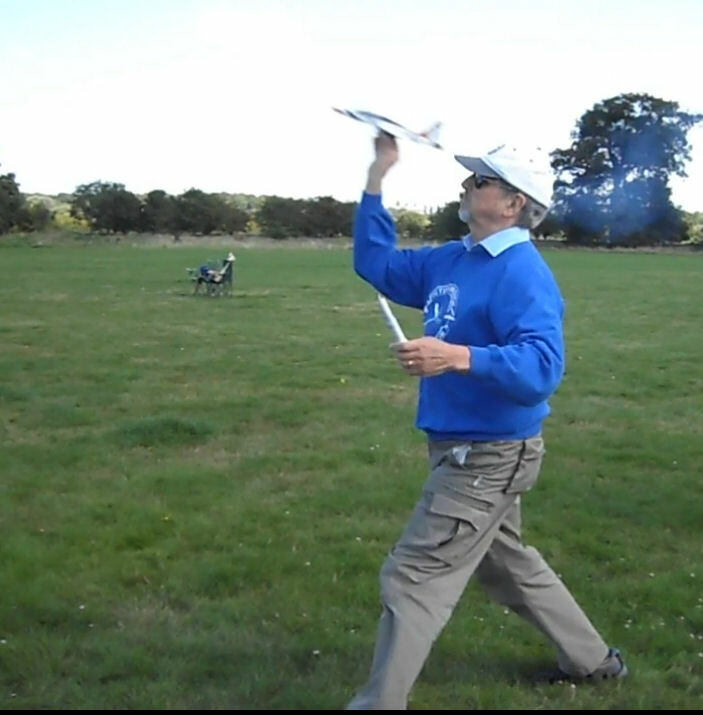 Chris Richards launches his La-15. Power is internal L-2 firing into an augmenter tube. 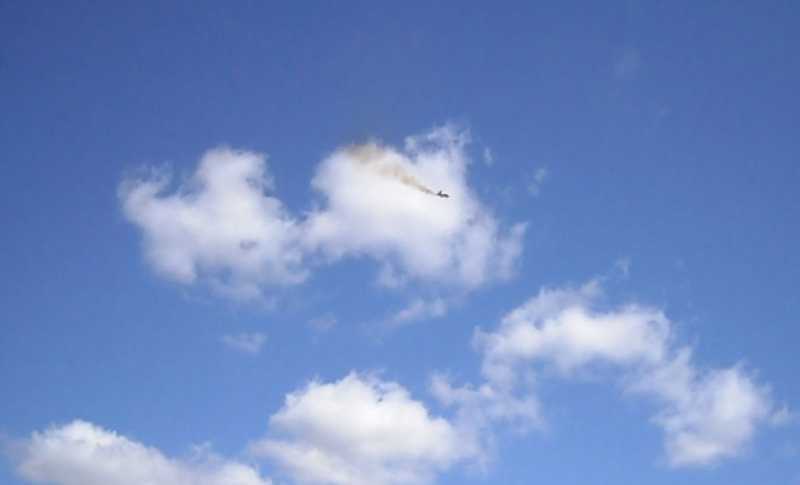 Above: proof the T-38 flies as well as it looks. Note the templates or even a part kit are available. As Andy says, we had fun trimming out the Corsair and Cutlass. The Corsair didn't like the bumby conditions at all, but the Cutlass flew well with a standard L-2 (after we'd sorted out the CG) and gives every indication of being a reliable model. I'll add more details and photos in due course. Meanwhile, roll on Old Warden!